OXFORD, Miss. – The head football coach at the largest university in Mississippi continues to publish Bible verses and Christian messages on his personal Twitter account, even after a prominent professing atheist organization took issue with his posts and demanded that he stop promoting religion on social media. 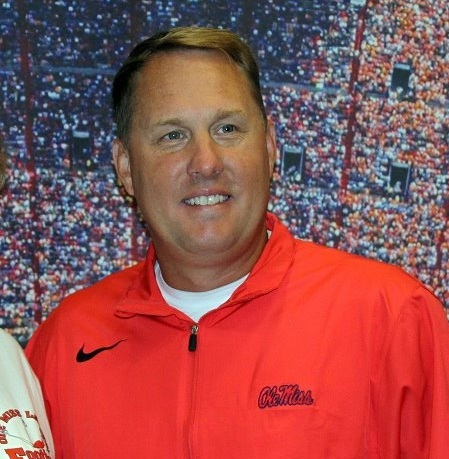 Hugh Freeze is the head coach of the football team at the University of Mississippi, a position he has held for five years. An outspoken Christian, Freeze regularly takes to Twitter to share Bible verses or inspirational Christian messages with his 182,000 followers. “Corporate worship is designed to keep us from ever taking the redeeming love and grace of our Lord for granted,” he posted on March 19. “Since our standing with God is based not on our righteousness but on Christ’s, in moments of failure, we can run to Him and not from Him!” he wrote on March 6. “It is only when the peace of God rules my heart that I can know real peace with others! !” he Tweeted on February 17. Although Freeze’s Tweets receive hundreds of likes and shares, the Wisconsin-based Freedom From Religion Foundation (FFRF) expressed opposition to his social media posts. In a recent news release, the group warned that the coach’s messages are potentially unconstitutional due to their “overtly religious” content. “Though FFRF respects Freeze’s right to tweet as a private citizen, he may not promote his personal religious beliefs while acting in his capacity as a university employee,” FFRF said in the release. Sam Grover, a staff attorney for FFRF, further clarified the group’s objections to Freeze’s social media posts in a letter mailed to the University of Mississippi’s chancellor. “Ole Miss violates [the Constitution’s Establishment Clause] when it promotes religious statements or allows its employees to promote their personal religious beliefs while acting in their official capacities,” Grover wrote. In the letter, Grover argued that it is unconstitutional for the University of Mississippi to promote Freeze’s tweets or allow him to post religious messages while serving as head coach. Grover also expressed concern at the tweets of Maurice Harris, an offensive recruiting coordinator who is also a Christian. Others argue that Freeze’s messages on Twitter are completely constitutional. In a statement to the Christian Post, Jeremy Dys of the First Liberty Institute said Freeze’s rights are protected by the First Amendment, no matter what his job position is. “We encourage the University of Mississippi to ignore the FFRF’s letter.” Dys said.